Babblings of a Mommy: Style Inspiration: Emma Stone. Well enough about my silly girl crush, let's talk about how fabulous Emma looks this gorgeous Grecian Lanvin gown that she wore to the Glamour Women of the Year Awards. 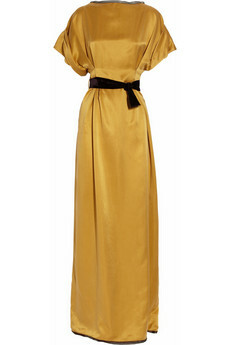 Roksanda Ilincic Silk Satin Gown. The Limited Wrap Strapless Dress. The Limited Full Skirt Tank Dress. I love the limited and milly dress. I am still on a mission to find a gown! That is gorgeous! I love that color and think many women would look good in it. I can't pull off that color, but I love it on fair skin. Good pick for a girl crush!